This dress was intended to be a birthday dress, but after much fussing in Photoshop I couldn’t get my initial vision to look as I had intended it to. Just for fun I gave it a bright red color and a playful golden pattern, and then I couldn’t bring myself to change it because it is just too cute. They don’t all have to be super fancy, and I love the movement in the skirt. Maybe this will be the year I finally do a full set of birthday dresses, but this is not the month they will start. Thanks to everyone who entered my contest last week! I enjoyed reading everyone’s opinions. The winner of the contest was Lorie Harding. I didn’t have the black and white version ready by last week, but it’s done now, with Mia modeling it for us. So, Lorie, please post a comment or e-mail me by next Friday to tell me how you’d like this one colored! Next week, we have Adventures in Tulle, in which you all get a view into my digital coloring learning process and we wind up with a ballgown with a tri-color tulle skirt. Don’t forget that you can now download PDFs of all of my 2014 dolls and outfits for free – easier than fussing with all the files individually! You can also follow me on Facebook, Twitter or Pinterest for sneak previews, paperdoll thoughts and pictures of pretty jewelry. If you enjoy my work, I’d also appreciate your support through Patreon. This dress is super cute, Liana! But I have been having one small problem. Just a few weeks ago, when I tried to print out a PDF for a dress, it wouldn’t print at the right size. Ever since then, I can’t get any dress for any doll to print large enough for the intended doll to wear it. I’ve tried enlarging the PDFs, but when they print out they’re the same size as when I tried printing them the first time. Can you help me? This is a cute fun dress. And though I’m not Liana, Sarah. You might be printing the PDF from your internet browser rather than from the actual PDF file. Make sure to open the file with Adobe or some other PDF viewer. I’ve had trouble printing things from my browser as PDF’s because the browser sometimes auto-resizes them without my permission. Thanks, RLC! And thanks for a very quick response. Since the contest ended, Liana, my favourite era for clothing has changed. Now it’s got to be during (and around) the Civil War. I just love hoop skirts! Thanks RLC! I don’t often print things off, I wouldn’t have known that. One other possibility is that your doll is actually larger than the dresses: when I first put up Mia, she was at full size, but I realized that if I wanted to draw a dress with a large skirt, it wouldn’t fit in the frame. So I decided to size everything down in the PDFs to 80% of the original so that I could draw dresses without being worried they wouldn’t fit. The larger Mia wasn’t up for very long, but check to make sure that the version you have is the version that’s on the site. How big is Mia supposed to be? The dresses were printing the right size for Sylvia and Iris, sometimes smaller. But thanks, I will check that. Check the PDF that’s currently on the site — I think that the right size has the dress and doll side by side or nearly so, while the one that was larger and got changed has the dress and doll kind of crammed into the frame. Hope it works! 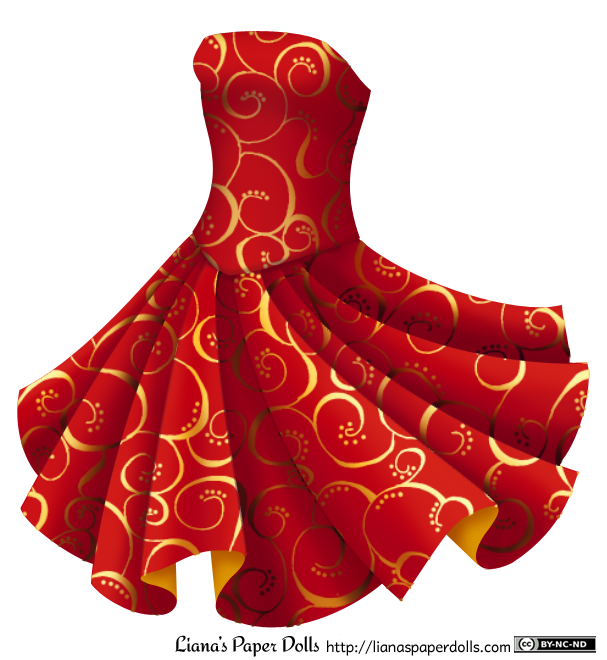 Oh, I just love this red and gold party dress and I love the movement in it as well. This reminds me of a “swing” coat I once had and “swing” dances. The fabric is very “Indian” and would make a beautiful Indian wedding outfit. Liana, Do you have any ideas for printing out the dolls on stiffer paper? They would be easier to dress. Hi Joyce, I always print the dolls and their dresses on white cardstock. If you want to go as far as I go, I cut the tabs off and laminate them also. I then attach the dresses to the dolls with Tacky (sticky putty, sticky tack, or whatever you might call it). Laminating also protects them from getting torn easily. Whenever I’ve needed to print them, I tend to take them to Staples or some place like that and put them on cardstock. Hi Liana. I’m excited to have won the contest. I have a few different ideas I’m thinking about and will let you know before Friday.